The Rocky series is adored by many, for all the right reasons, but even the biggest fans of the franchise are quick to admit that the silliest one out of all of them is by far Rocky IV. This was the one where Sylvester Stallone’s Rocky Balboa not only went up against a superhuman Russian boxer played by Dolph Lundgren, but did so right after completing perhaps the most 80s training montage ever put to celluloid, which ended with the Italian Stallion climbing a mountain and shouting his opponent’s name at the top of his lungs, and a while after the death of his friend and former rival Apollo Creed during an exhibition match that was about as campy and patriotic as you can imagine, with none other than James Brown even performing his song “Living in America” over it. Oh, and did I mention that there was also a robot in the movie? Yes, all of that stuff did indeed happen in the wildly bonkers yet beloved fourth entry, so much so that you could never imagine a movie like that existing in a grittier, much more serious narrative. However, with Creed II – the follow-up to the critical and financial hit that continued the Rocky legacy, only with the focus being on Michael B. Jordan’s young aspiring boxer Adonis Creed, the illegitimate son of Apollo Creed – they have basically made a direct sequel to Rocky IV, setting it within the far more grounded and dramatic reality established in the previous film, and fans of that movie, as well as of the whole series altogether, are in for a real treat when they see how respectfully and satisfyingly they have continued that particular story. Luckily, it’s not only a great follow-up to both Creed and Rocky IV, but it’s just a great movie in general, continuing the characters’ journeys with grace and emotion while never sacrificing what made them appealing to begin with. Taking place a few years after the events of Creed, Adonis (Jordan) has just become the heavyweight champion of the world, with the support of his girlfriend Bianca (Tessa Thompson) and his trainer, Rocky Balboa (Stallone). Things are going well for him, having proposed to Bianca and soon learning that he has a baby on the way, and the newfound respect he has received in the boxing community. However, former Russian boxer Ivan Drago (Lundgren) – the man who killed Adonis’s father in the ring thirty years ago – re-emerges with a challenge to the young Creed: fight his son Viktor Drago (Florian Munteanu) as a means to regain the honour he lost after being defeated by Rocky in the fourth film. Filled with a desire for vengeance as well as a growing ego, he ignores the advice of everyone around him, including and especially Rocky, and decides to accept the challenge, which puts him on a path that could see him meet the same fate as his father. As I’ve already mentioned, Rocky IV is definitely the most outlandish of the original Rocky series, and certainly the one that oozes the look and tone of the 1980s the most, so it is really impressive to see what they have managed to do with transferring those film’s plot elements and characters into the Creed continuity. Ivan Drago in Rocky IV was an intimidating villain, but was really just kind of a blank slate with very few words of his own and only existed as someone for Rocky to fight; in Creed II, however, he is incredibly humanised and even has more than one thing to say this time around. He has probably the biggest arc in the entire film outside of Adonis Creed, as a direct parallel to Rocky Balboa and how in his community he was and still is considered a hero even when he lost all those fights, whereas Ivan Drago was pretty much shunned after his loss against Balboa in his home country and has spent the last thirty years tirelessly training his own son for a chance to show the world, as well as his own people, that he can be great again. However, unlike in Rocky IV, he isn’t written as the straight-up bad guy either; in fact, they do a lot of interesting things with his character that have him confront his stern parenting skills, as well as his own inner anger for losing that climactic match against Rocky, and the character is so well written here – not to mention performed perfectly by Dolph Lundgren, who returns to one of his very first film roles as though he never left it – that for the first time in thirty years you finally get to understand what Ivan Drago is going through, and it makes for one hell of a satisfying pay-off. 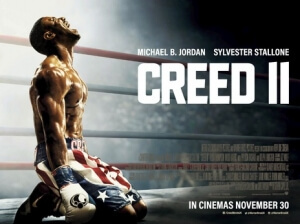 The rest of the movie works extremely well as a solid continuation of the Creed storyline, with Michael B. Jordan and Sylvester Stallone once again on top form as boxer and trainer respectively, as is Tessa Thompson whose character was previously introduced as having a progressive degenerative hearing disorder, and is now carrying a baby which could potentially suffer from it, which gives her plenty to work with outside of being just the girlfriend character in these movies. Their performances are great, as is the strong direction by Steven Caple, Jr. – taking over from Ryan Coogler, whose summoning to Wakanda prevented him from returning as director here – who provides the film with plenty of emotional moments that really hit you in all of the tender spots at exactly the right moments, as well as a powerful understanding of what makes a boxing match look and feel as cinematic as the ones he portrays here. The script certainly follows the standard Rocky formula down to the letter, but it’s executed and performed so well that it’s never really an issue, as you’re just sucked in to this journey and the drama surrounding these well-written characters that it just makes you want to roar with excitement right there in the screen. I’m not so sure where they could possibly take the Creed saga next, but whatever they end up doing, as long as it’s anything like this or the previous movie, then I am already in line to buy my ticket. Just don’t call the next one Threed, whatever you do. Creed II is both an incredibly powerful and emotional follow-up to Creed, which once again sees stellar work by Michael B. Jordan and Sylvester Stallone only this time under the strong direction of Steven Caple, Jr., and also a pretty effective continuation of events and characters from the much sillier Rocky IV, especially with how they evolve the character of Ivan Drago and give him more layers than you ever thought were possible with this character thirty years ago.